One of the most challenging aspects of advocating for pollinating insects is trying to defend wasps, hornets and yellow jackets. These insects are a crucial component of our environment, however, their aggressive temperament and willingness to sting make them appear a nuisance. Companies such as Orkin, Modern Pest Services, and Bayer, have capitalized on public fear of insects by offering a cheap solution; eradication. Two big problems exist with this philosophy. The first is that insects are a necessary part of the ecosystems that exist in lawns and gardens. Not only do they pollinate flowers creating fruits, vegetables, and healthy, diverse vegetation, they also serve as food for other animals. To cut out a colony of 20,000 or more will certainly impact a garden’s habitat. The second problem is the method used to implement mass eradication. Typically, an extremely strong pesticide is sprayed killing the entire colony. 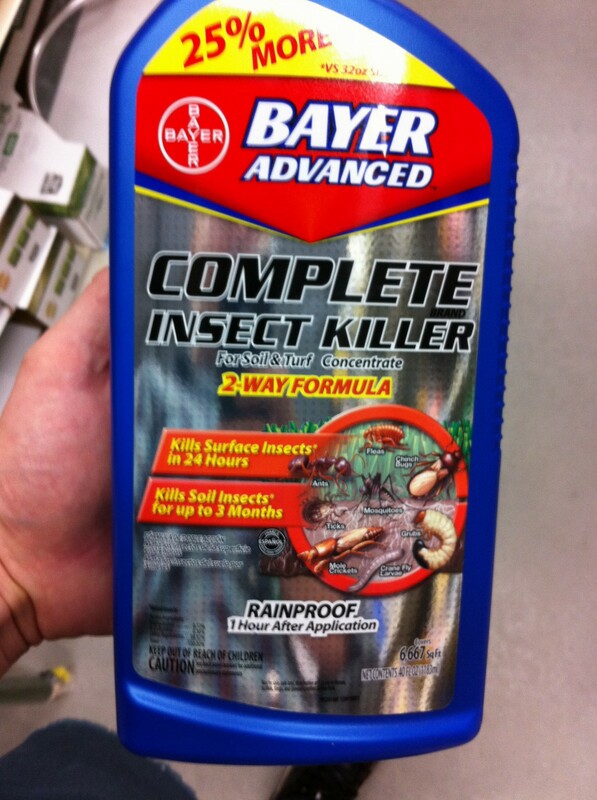 These chemicals are not only toxic to the targeted insects they are also toxic to almost every other living organism. Some of these pesticides are already in the plant, systemically grown from the seed which is a problem to be addressed later this week. 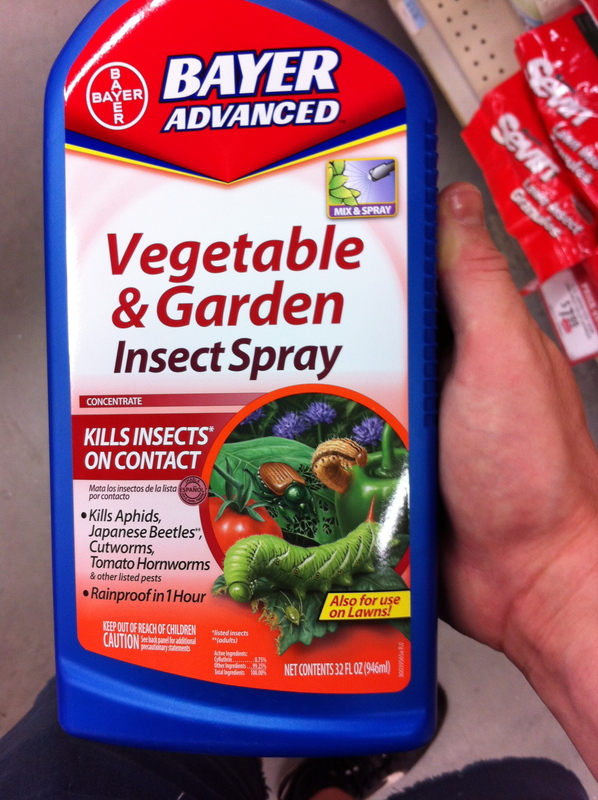 Pesticides have certainly helped increase crop yield allowing humans to produce surplus food, however, a change of attitude is needed when deciding how to manage pests on a household level. Simply put, there is no safe pesticide. There will always be collateral damage around the area treated. Therefore, it is in one’s interest to use a more environmentally friendly application; one that is less harmful both to the person applying and the insects surrounding the treatment area. Often times, these solutions are simpler and less expensive than calling the Orkin man. 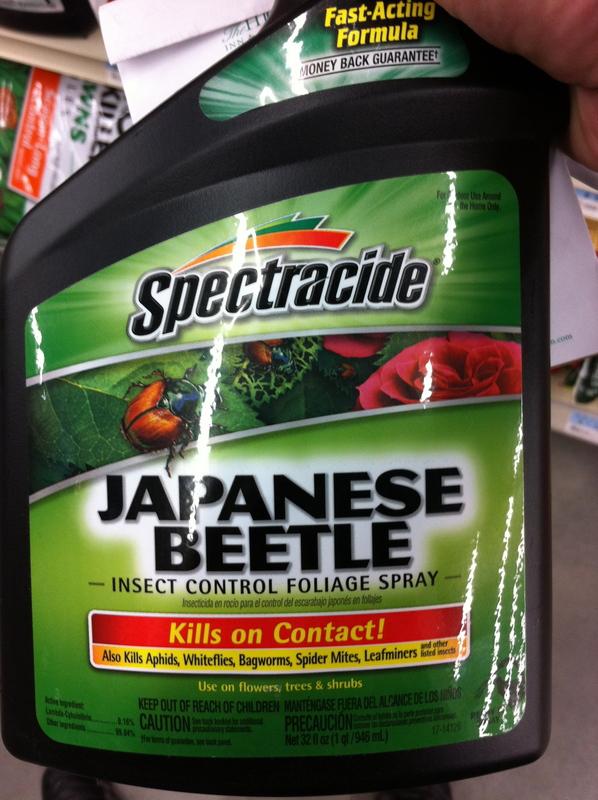 Decide if killing the insects is completely necessary. Research what the insect is and if it is providing a service to your lawn or garden. For instance, wasps are beneficial in that they prey mostly on other insects and avoid human activity. The wasp is a nuisance only when it’s nest is in a home or near a high traffic area such as a porch or lawn. 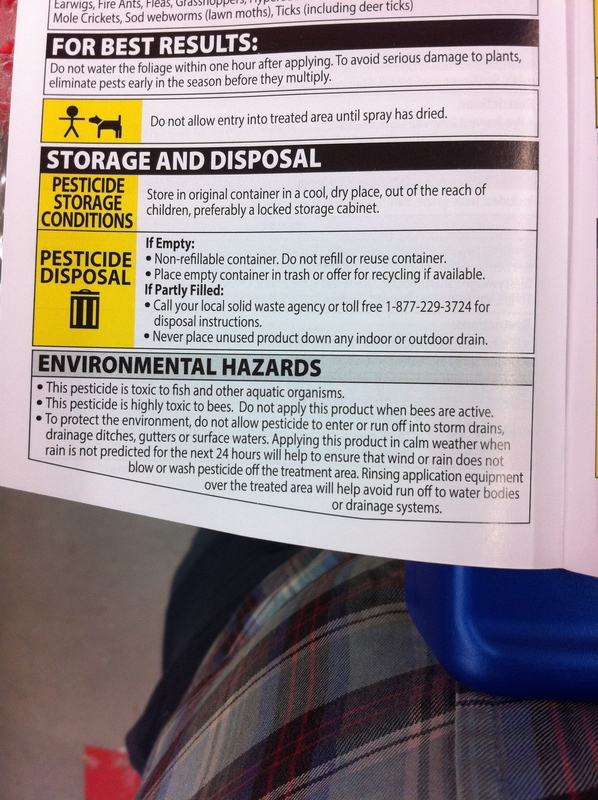 Often times a local beekeeper will have good insight into dealing with pests. Give one a call. Check your state beekeeping association’s website for suggestions and information on local beekeepers. Beekeepers generally appreciate old time wisdom and are usually excited to talk to someone interested in alternative ways to solve modern pest problems. Some are also licensed applicators and will do the same job as an Orkin man safer and for less money. Know if you have any allergies to the insects and if so, ask someone else for help. If you have the courage to deal with the insects on your own, know what you’re up against. 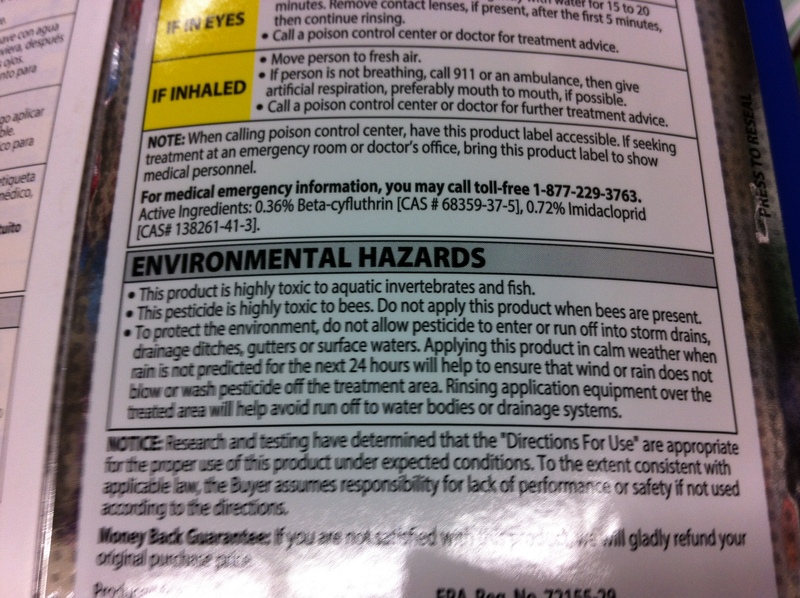 Wear protective equipment and use safe, environmentally friendly, non-toxic methods first. Keep in mind many insects return to the nest at night. This is usually the best time to deal with them. Think ahead through problems that could arise and try to anticipate them. Most importantly, BE SAFE. Make sure no children are around and have a back up plan should the unexpected arise. 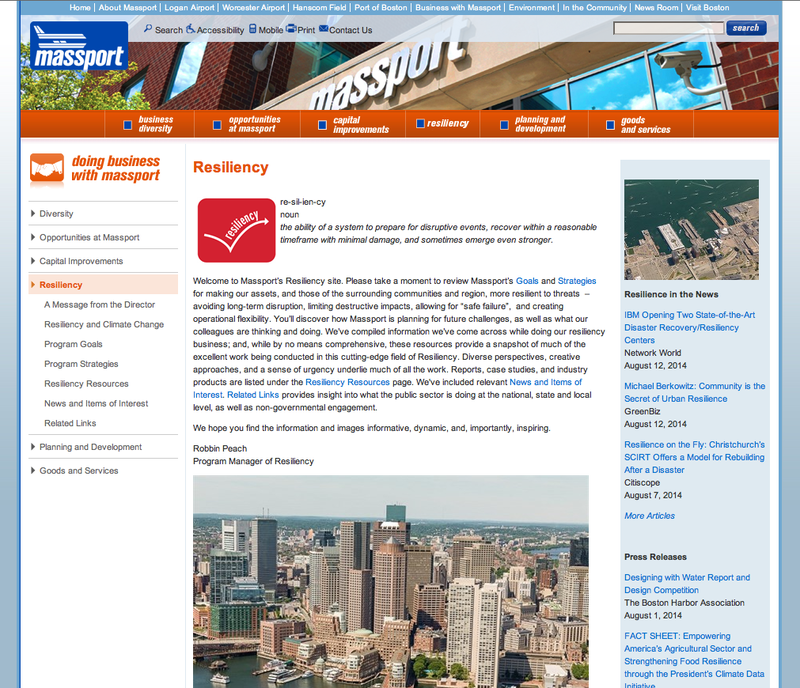 I’m thrilled to announce that Massport’s Resiliency Website is now live! Click here to visit the homepage and explore the site further by using the navigation panel on the left-hand side. You’ll find messages from the Program Manager of Resiliency and the Director of Capital Programs & Environmental Affairs, along with information on Massport’s efforts to reduce greenhouse gas emissions and the Resiliency Program’s goals and strategies. The site includes useful infographics and LiDAR models, along with photos of Massport’s airfield and maritime properties. You’ll also find a comprehensive list of links to resiliency resources, which include articles, reports, case studies, related organizations, and more. The Resiliency Website is now live. These webpages represent the bulk of my work this summer and I’m thrilled that we were able to include them on Massport’s official website. I hope that this resiliency section serves as an informative resource for anyone who wants to learn more about this important and timely topic. How can one really ease the movement of an outsider in a new terrain or coax entry where all other spatial signs are discouraging for a person unfamiliar with the place. As an architect I understand the principles of urban landscapes and human behavior, while as an artist and designer I want to address the issue in a way that synthesizes the different disciplines. An important component of way finding was the insertion of “attractors” which would be the points of generating interest in an otherwise unwelcoming space, landmark at important turnings and an artistic way of introducing infrastructural support. It is basic human psychology that we can overlook negatives of our environment, if not associate a positive connotation with a space, if there is a presence of an art intervention in it. It is this very idea that inspires the creation of some of the most beautiful street art / urban installation in some of the most damaged public spaces. My goal was to install these attractors at strategic points in the village to highlight a range of issues from the reclamation of a space, the cleaning up of another, to bringing light to some of the darkest streets. Like I’ve mentioned earlier, the garbage issue of the community has been a big problem and I’m finding the need to address it in every aspect of my project. It is integral to most of the problems of the community from their own infrastructure to the prejudices harbored by outsiders. 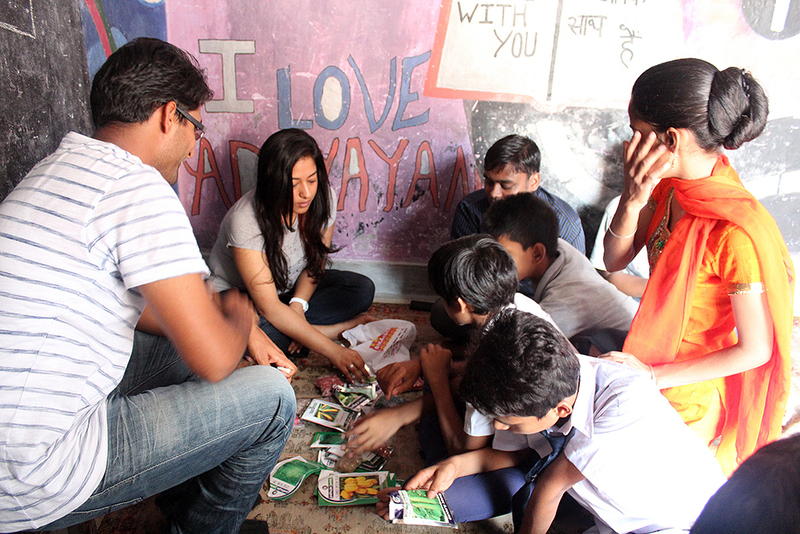 For the past 4 weeks, I had been holding workshops with the kids at making installations from waste to highlight a particular issue that they wish to address in their community. Some of the topics that came up and led to three-dimensional explorations where the concerns regarding dark and narrow streets or stairwells, the water shortage in the area and its wastage, and the excessive littering and spitting of betel-nut juice in the streets. The subsequent urban installations that came up were the students’ interpretations of making others aware of these concerns in the streetscape. 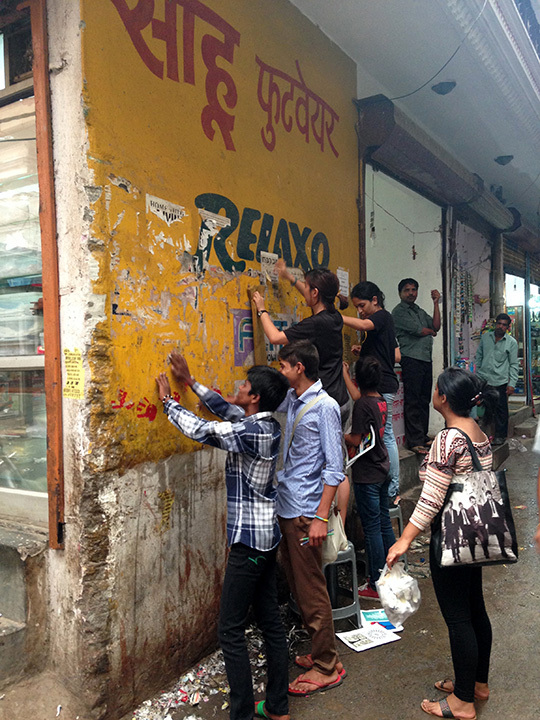 Our project was not meant to be a cleanliness drive for the community. Though we tried to tackle the issue to the best of our ability with the limited resources and time, we wanted to address the larger issue of the mobility through the streets. Therefore, our interventions which include cleaning of certain spaces are tied with the insertion of our public murals/installation in those spaces to highlight our role in reclaiming that space instead of the unusual attention to their duty on the part of the municipal cleaners. Having established certain way-finding clues to guide people’s movement through the village, we now set about targeting spaces which are either important visual locations in the form of T-junctions & crossings, or those which are particularly unfavorable in passing through by either being too dark, narrow or trash filled. We started to art bomb these spaces. 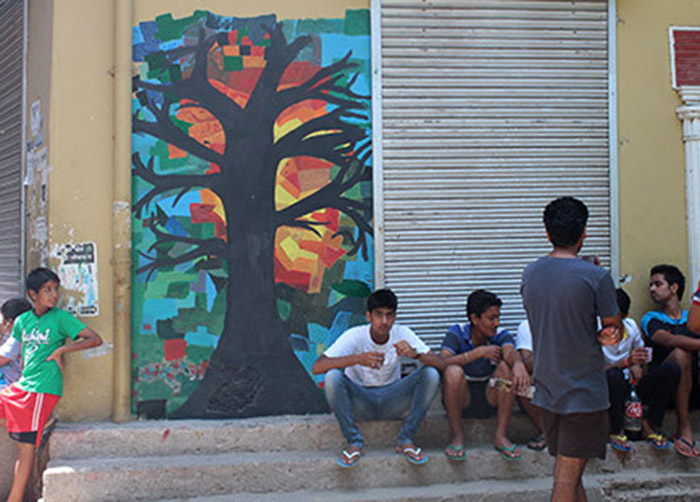 Our interventions are of 4 types – painted murals for striking visual impact, murals incorporating tactile and temporal elements, adding a textural or sound quality to them, to be experienced by touch for narrow streets where people’s instinct is to run their hands along the walls as they move along. 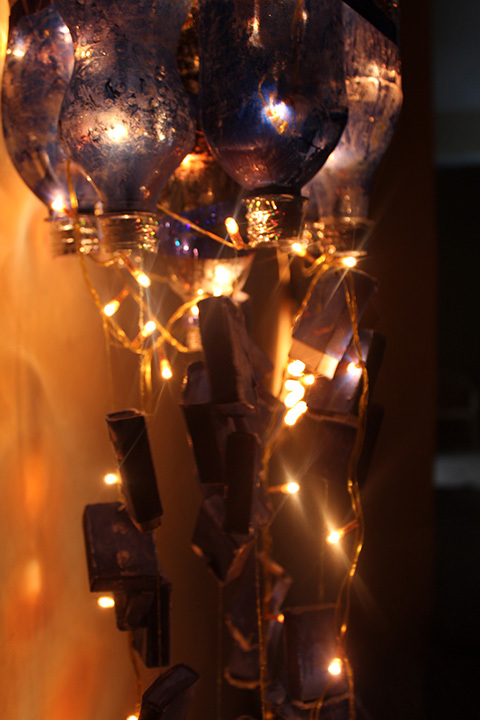 Additionally, we are installing installations that incorporate light features for particularly dark spaces, and installations from reclaimed trash for spaces with a lack of adequate surface area to paint on. 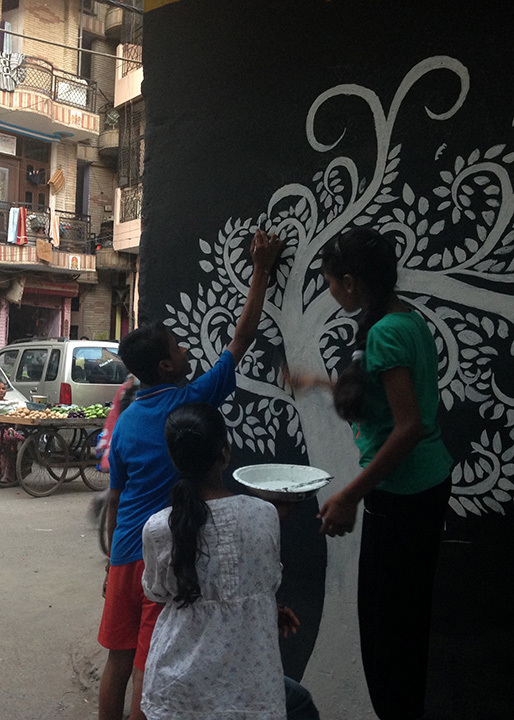 We have been joined by a group of very enthusiastic volunteers from the neighboring Delhi University college – Lady Sri Ram College for Women in this street-art phase of the project, whose creative inputs and mentorship is great for the kids, only exposed to my thoughts and ideas all this while. These volunteers also form an important group of outsiders uncomfortable with entering and engaging with the Zamrudpur community, suffering from many of the prejudices I am hoping to fight. 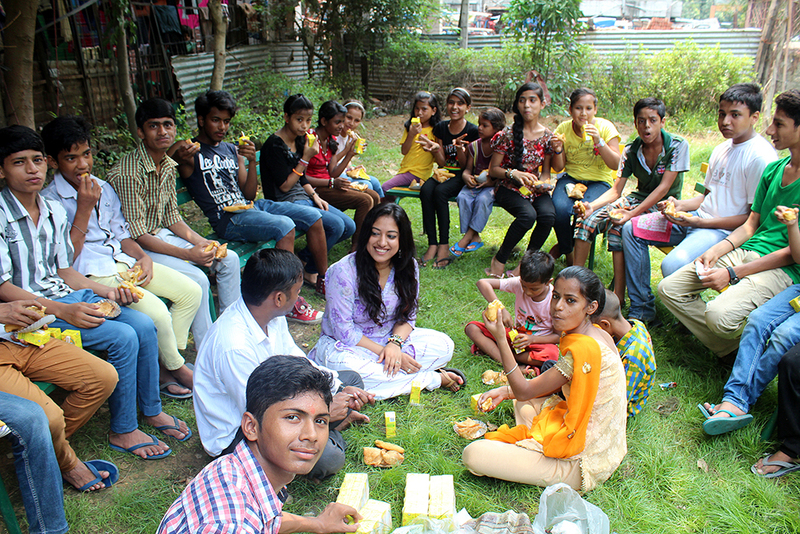 Having a small group actively work with us is a great way to start breaking this barrier, since they go back and talk to their friends about Adhyayan and the community, thus generating an interest among others. This phase is also an exercise in taking ownership of spaces in the urban streetscape. By marking places that we are cleaning up, with art, the hope is to deter their re-degradation into unfavorable trash dumping sites. This has helped support our arguments and meetings with the government and municipal officials that we are trying to meet weekly, and maintain pressure on to become more active in their dealing with such urban villages. This weekend saw two big celebrations in India, especially Delhi. 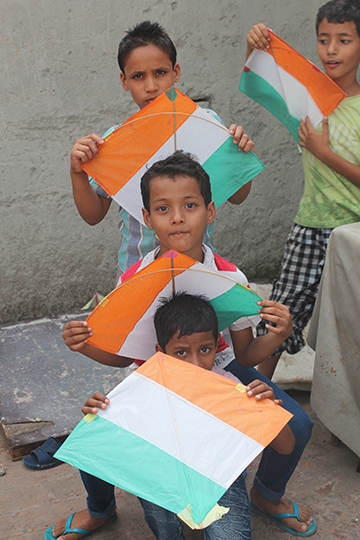 Friday marked the 67th independence day of the Republic of India. 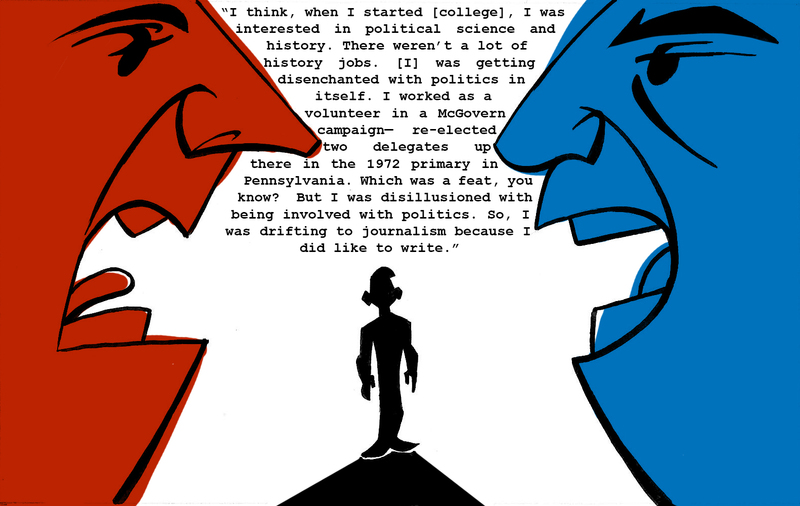 Politically, it’s a somber event, lacking the fun and festivities one associates with 4th of July in the US. Our equivalent of a day filled with parades and festivities is on 26th of January, the marking of the establishment of India as a sovereign republic in 1950. But culturally, this doesn’t stop people from celebrating! 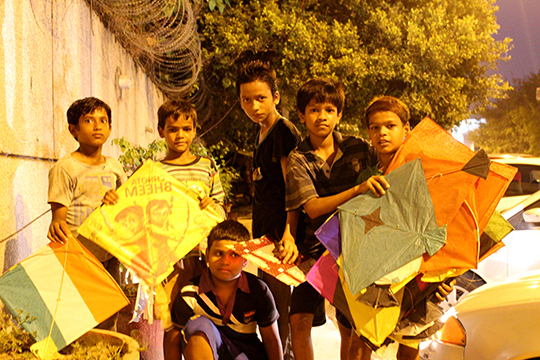 Over time, kite flying has become associated with the holiday and in the days leading up to it, one can see skies across northern India smattered with a colorful array of fluttering and flying paper. Two days later, the Hindu calendar celebrated Krishna Janmashtami, the birth of Lord Krishna, the eighth avatar of Vishnu the preserver and one of the Hindu Trinity of the divine. The festival has cultural as well as religious connotations as Krishna was a young, playful god, whose mischiefs and shortcomings make him one of the most accessible deities removed from the revered pedestal of awe that many others are placed on. The festival’s celebrations include musical enactments of the life of Krishna and recreating his famous mischievous antics of youth. 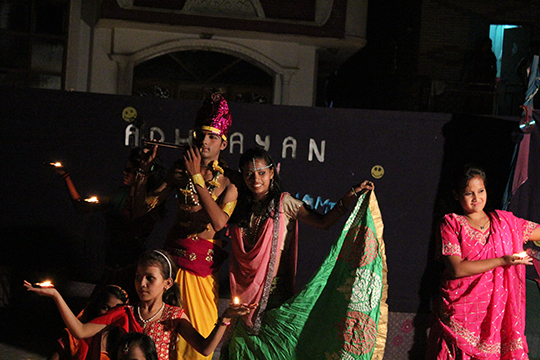 These two days are very big on Adhyayan’s calendar as the kids hold a performance filled celebration. 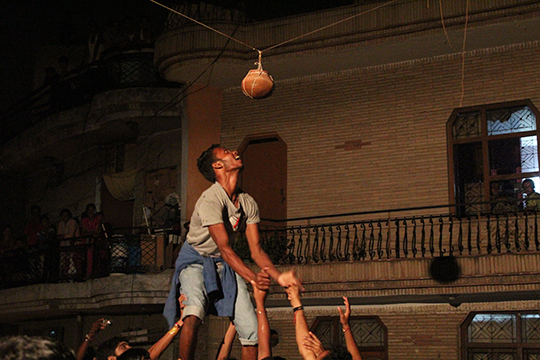 Shows are put up every year, completely choreographed by the students themselves for the neighborhood and guests from outside. 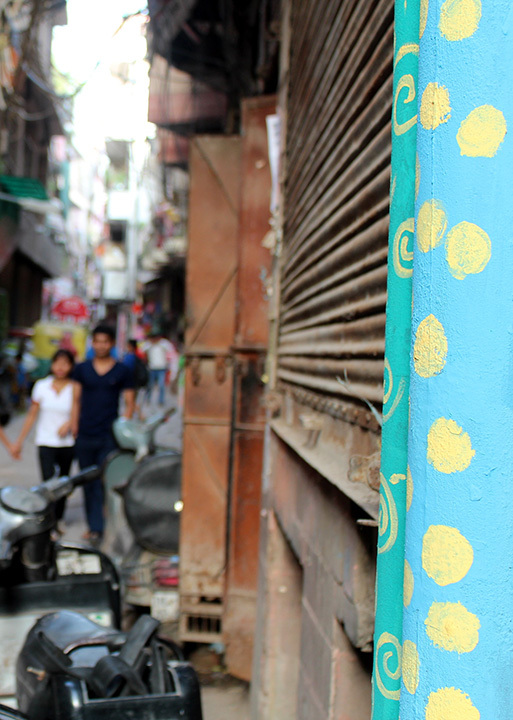 When I was conceiving my own project with Adhyayan, I had wanted to hold a pop-up performance in the community, which could act as an attractor for our ongoing project and be an experiment to test our way-finding interventions in the streetscape of the community. 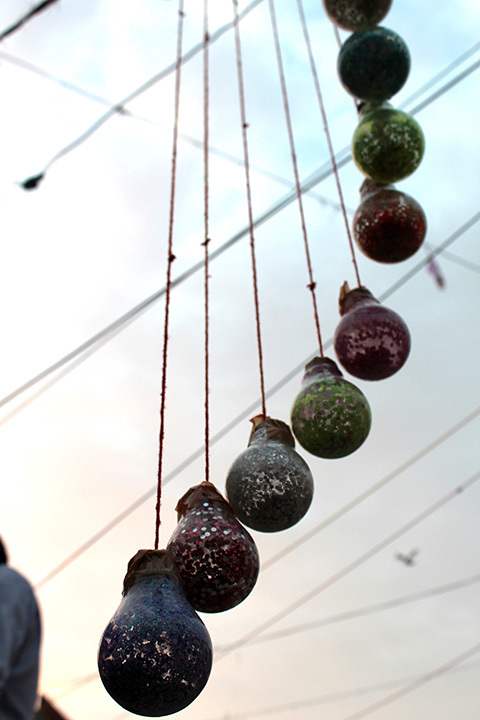 The overlapping of these festivals was a great coincidence and opportunity. 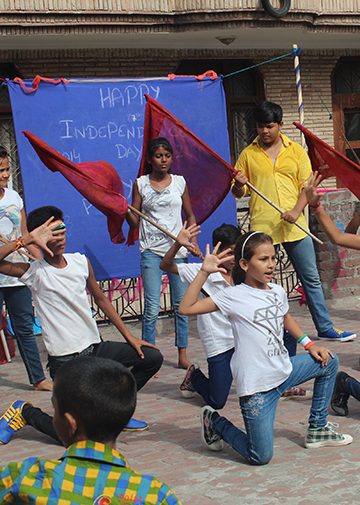 The week leading up to this long weekend of holiday and fun had the kids get quite caught up with the kite flying and the preparations for the plays and musicals performances and we slowed down our work on the project for a few days. My first week of mapping exercises with the students had produced some incredible graphic directions to their own homes. It was their first introduction to a mapping exercise, where by concentration only on the streetscape most pertinent to reaching their own homes they were learning lessons in identifying landmarks, both visual and sensorial, and understanding choice of movements when faced with multiples routes. They were also most importantly, identifying physical spaces that they realized would be uncomfortable for an outsider to navigate. 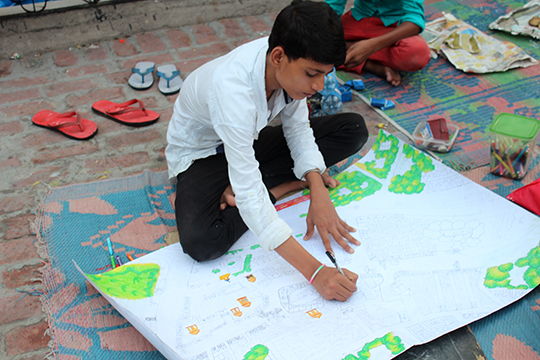 In the process, they had created some beautiful drawing and maps of the village streets. I had been trying to find a way to display these creations as well as make them accessible to more people outside the community to generate awareness. I decided to use this time to create cards out of these maps, something small and cheap enough to be mass produced, could be used as a stationary by Adhyayan in sending out invites/ notes for their events and which could generate an interest in the streetscape and neighborhood of Zamrudpur. This was an attempt at creating awareness flyers for the project, having a use as well. 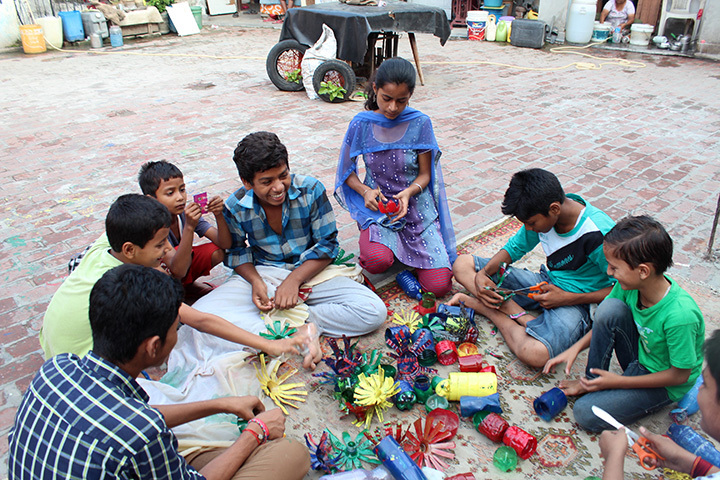 Additionally, the NGO tries to sustain itself without donations as much as it can, where most of their revenue comes from having created a small business of candle making, art and curios made by the kids themselves during various workshops, which they sell during the annual Diwali time festivities around the city. 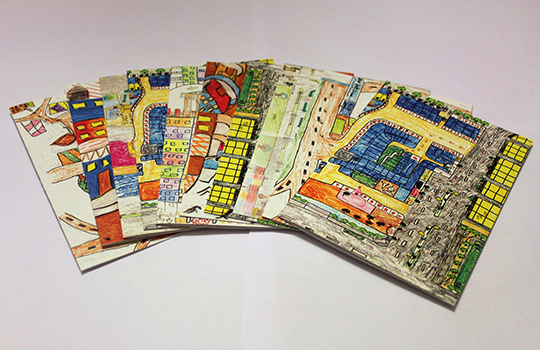 These cards also make an excellent stationary item for sale, which could add to their self-funding. About two weeks ago, I presented Massport’s Resiliency Website during the CEO’s Senior Staff Meeting. We got positive feedback and the website is now slated to go live in early September. The launch of the website will also be accompanied by a press release from Massport. Although I wasn’t able to see the website go live during my internship (yesterday was my last day of work), I’m excited that the project has progressed this far. 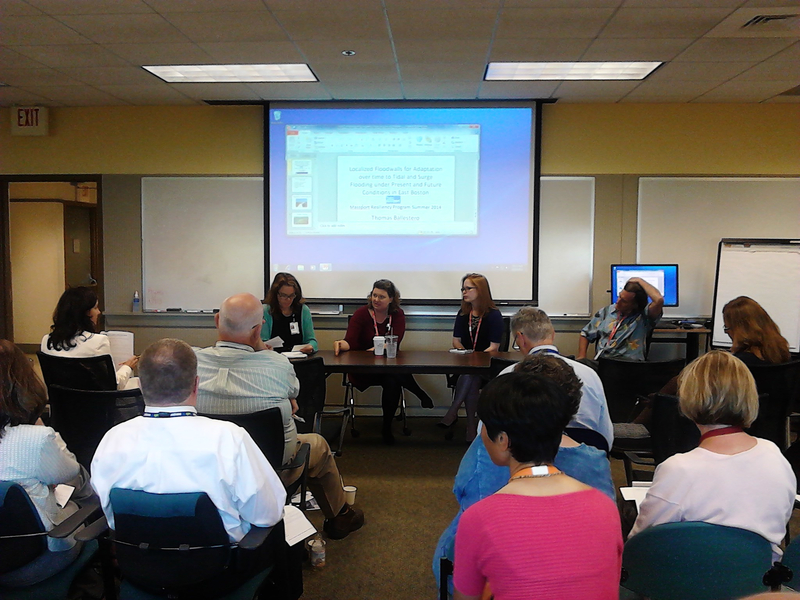 We also held our second Resiliency Speaker Series event yesterday. We welcomed Gina Ford, Principle of Sasaki’s Urban Studio; and Tom Ballestero, Director of the University of New Hampshire Stormwater Center. Gina discussed Sasaki’s Sea Change: Boston project, and Tom talked about community engagement in East Boston and made flood barrier recommendations for Massport facilities. We had a great turnout, with about 50 attendees, and a very productive Q&A session at the end of the event. The Resiliency Program’s Speaker Series event on August 18th. Thanks to the work I’ve been able to do this summer as a Maharam STEAM Fellow, I’ve received an invitation to attend an international symposium on resilience. The event is hosted by the National Institute of Standards and Technology in partnership with the Center for Resilience Studies at Northeastern University. I’m thrilled to be included as part of the conference, during which I’ve been asked to document and synthesize my observations. These notes may be included in the event’s final report. I’m sorry to see this internship end, but I hope that I’ve completed one out of many future work experiences in the resilience field. I’m very grateful to RISD and to Maharam for facilitiating this unique internship experience and I intend to continue putting the lessons that I’ve learned to work. 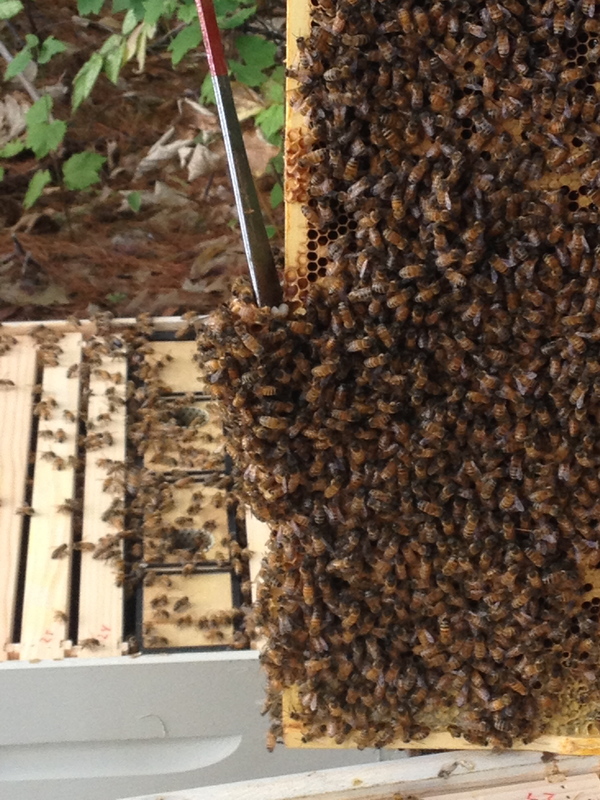 As I continue work on the design and construction of the mobile hive, it is necessary to regularly inspect the colony. During these inspections, I gauge the overall health of the colony by checking the bees for potential Verroa mites (tiny blood suckers that can destroy colonies and have b een linked with the decline in bee populations), by locating the queen to be sure she is still alive and well, and to inspect each frame to see if they have built any new queen cells. New queen cells are a sign of a potentially sickly or dead queen and can also signal the potential of a colony getting ready to swarm. This week was the first time I have opened the hive to give a demonstration to an audience. With children ages 2, 3 and 11, and adults asking question after question, I realized it will be much easier to discuss the intricacies of the colony with the observation hive rather than during a hive inspection. Beekeeping is a gentle practice. It is a ritual (the use of the smoker for instance) and a process that requires focused attention and a tuned intuition. 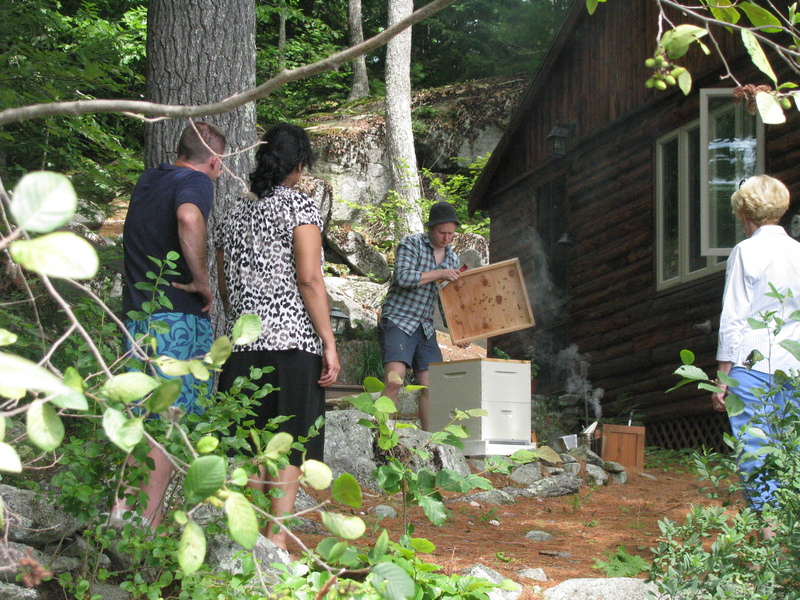 When one is inspecting the hive, disrupting the bees’ work, it is important to be calm. With an audience this practice can quickly go from quiet routine to distracted management. Luckily, though the bees were more agitated than normal, their docile demeanor wasn’t compromised and they behaved elegantly with the spectators. During the inspection I noticed cells being built on the bottom of a few frames as well as one abnormally large (potential queen) cell in the middle of a frame. I didn’t think much of it as the cells didn’t seem to be the typical peanut shaped queen cells. Today, however, I noticed increased activity throughout the day. Around 4 pm there was a large crowd of bees, more than I had seen at the hive before, flying in and out and seeming to be getting ready to swarm. I called Master Beekeeper Erin Forbes who told me that though they could be getting ready to swarm it was unlikely as it was too late in the day. Bees typically swarm between 9 am and 3 pm. She mentioned though that the bees could be practicing for a potential swarm the following day. What I needed to do was open the hive, find the queen, and remove any cells that could be holding new queens. After using the smoker, opening up the hive, locating the queen, and removing the potential new queens, I put the hive back together and they seemed to calm down. I’ll open the hive again in a few days to see how they’ve recovered. I’ve been updating it regularly with stories, but it has a lot more to offer. 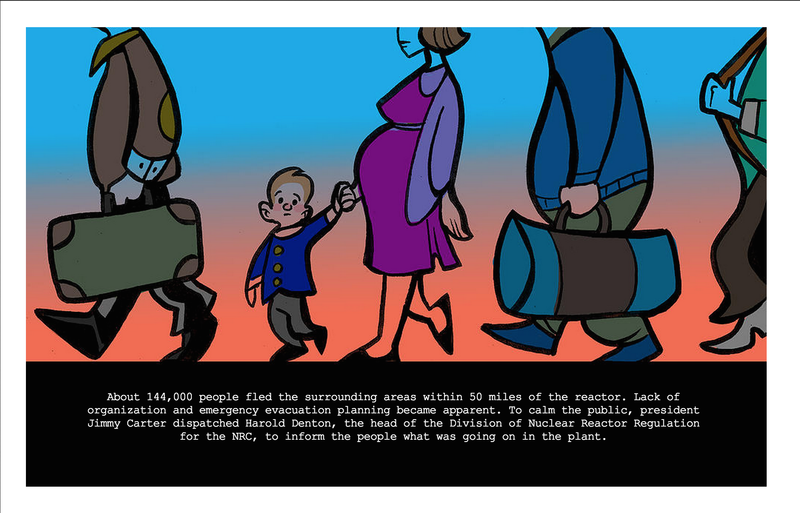 It’s got listings of additional resources for those interested in learning more about Three Mile Island, the NRC, the nuclear industry, etc, as well as galleries of photos and sketches I made while conducting research. Please feel free to visit the site! Preview from a brief bio of the accident at TMI. Preview of a story from the perspective of a statehouse reporter: RB Swift. 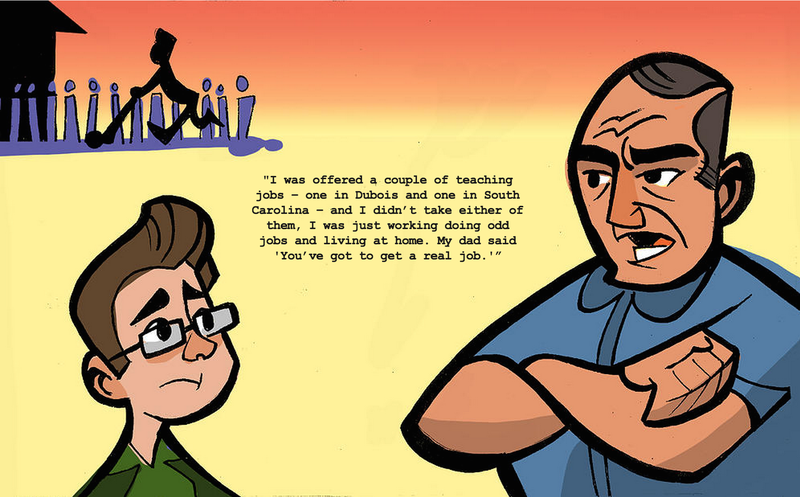 Many of the issues encountered in the design process are also found in the education system. From developing the most appropriate means to communicate an idea or intention, to the age-old discussion of quality versus quantity. In my experience as an intern, I’ve discovered a common theme among various fields, and have learnt that many of the toughest decisions, especially in education reform, come down to this very concern. Today at lunch, for example, a very popular program came up in our conversation: Science without Borders (or Ciências sen fronteiras, as we say in Portuguese). The program has a government grant to send thousands of Brazilian college students overseas for up to one year. While this program has been largely successful, it is also an ambitious one, costing the government a nice chunk of their education funds. While many approve of the opportunities generated for students who would otherwise not have the means to leave the country, especially during their studies, others argue that the cost-benefit of this initiative is not worth the investment. This is a classic example of quantity versus quality question, and how public policy can be geared toward either side of the argument. The intention is that these Brazilian students return to Brazil after an eye-opening experience feeling empowered, and demand even more from their home institutions. On the other hand, the number of students who are accepted to the program is limited, for an obvious reason of cost. This question of quality versus quantity is the essence of many decisions in industrial design. How do we create pieces that are unique, yet reproducible? And how do we limit the unavoidable flaws that accompany increase of scale in production? When a piece is produced, an industrial designer’s job includes tracking the production process, ensuring that the product maintains the highest quality with the increase in quantity. In education policy, we ask questions like: Would it be better to invest this money in a reform that would affect a larger amount of students, or can the education system rely on the students who return from these programs to implement the changes they bring back with them? Measuring these results is among the greatest challenges in education policy reform, and in any innovation. Below are a few articles I’ve gathered that address the question of metrics, impact assessment and quality versus quantity in education issues. How To Measure Innovation (To Get Real Results), from FastCo. 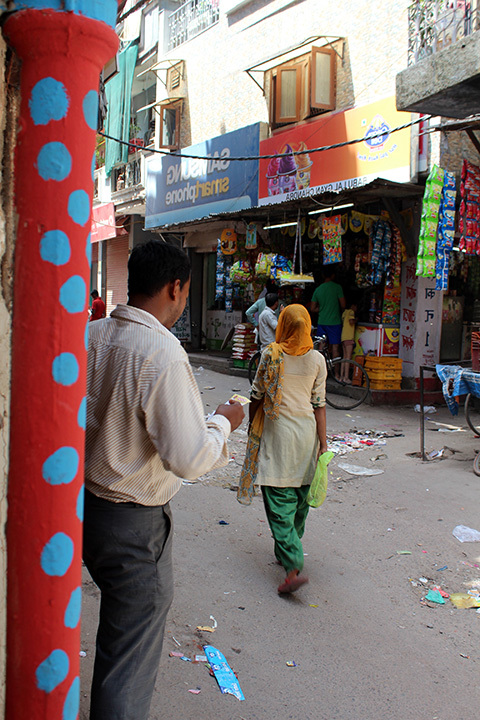 As I continue my explorations in navigating the streetscapes of Zamrudpur, I can’t escape the garbage problem of the community. While there seems to be a slight improvement in the municipal corporation’s role with our last week’s meeting and the realization of the community towards its power of proactive engagement with the government, and the slight initiative by food venders and shopkeepers to provide dustbins after our weekly community meetings, there is still a major gap in the way the households dispose of their personal waste. 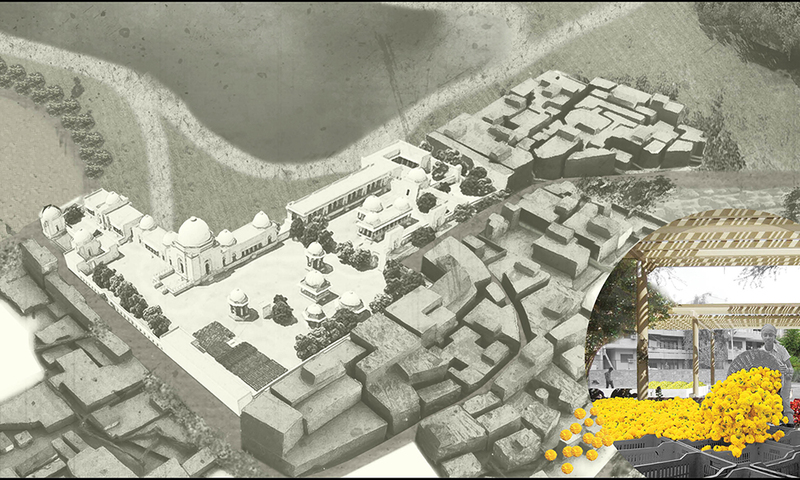 In my master’s thesis, I had explored the potential of urban farming in another urban village of the city involving the strategic reclamation of parts of the Delhi green zone. 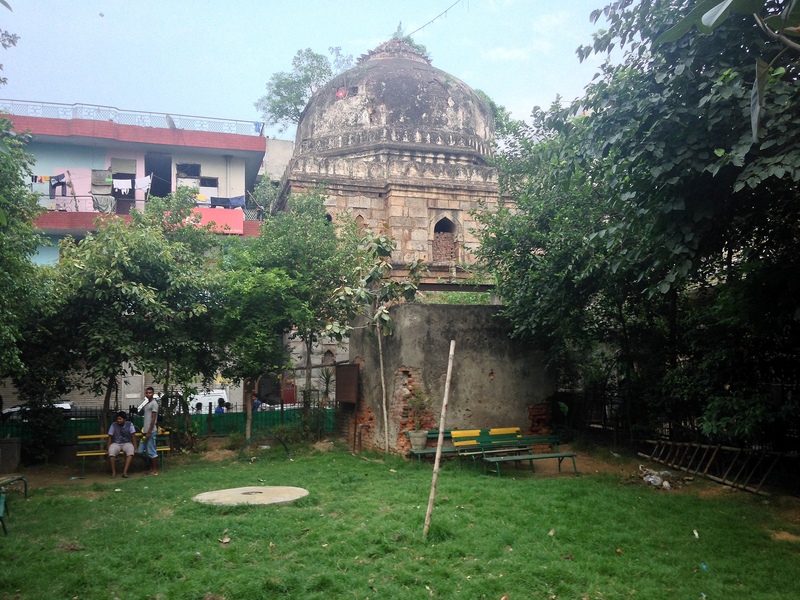 Though at a larger, more practical scale, I was already warming to the idea of its potential in Zamrudpur. Despite Delhi having a number of optimum conditions for urban farming like the presence of a good soil, adequate sunlight and excess of flat surfaces in the form of waste plots / flat rooftops, not many people are engaging in it. Along with all the navigation and attractor strategies in the village, I felt that urban cultivation could be the vital ‘activator’ for the community. 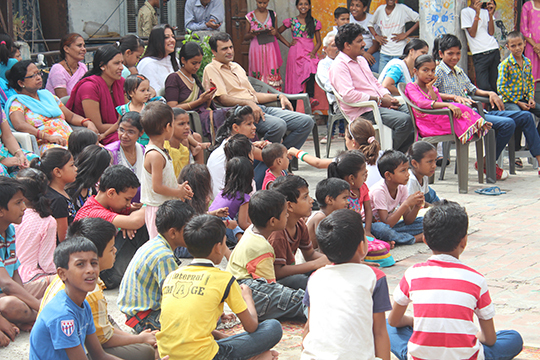 Moreover Adhyayan with its students could be the perfect demonstrational and teaching set up to empower the rest of the community to accept its practice. Most households in the village, though live in tiny one-two room apartments, have access of the large roofs of their buildings that are currently used as spillover spaces. Moreover, the presence of a few families still engaging in dairy production provides the community with free excess manure. In short, they have the perfect set up to start growing their own fresh food, a lot, of which they can’t afford to buy too often from the market. Additionally, some of my earliest exercises in the village with the children regarding mapping of spaces had brought out the jarring absence of a recreational public space within the community. While there was one small fenced green area, it was being used as an open dump by the surrounding buildings and the residents were accessing the neighboring colony’s municipal park outside the community for recreation. One couldn’t fathom why the community wasn’t actively claiming the park. 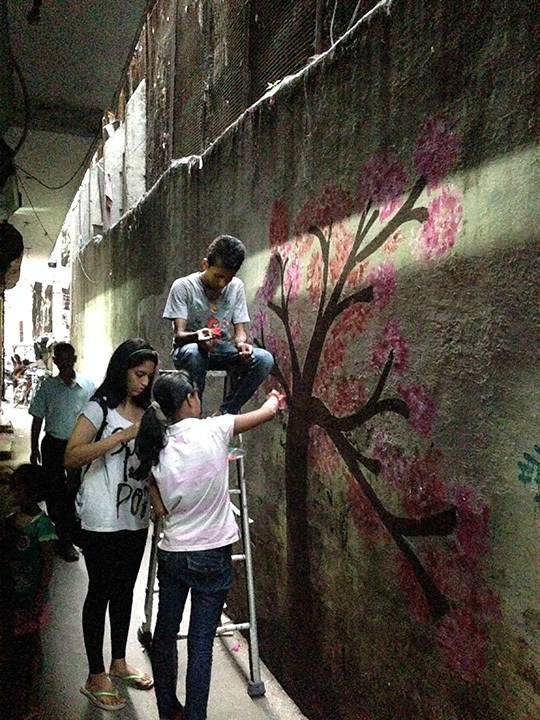 It wasn’t just about cleaning up the space, there needed to be a conscious programming of the space to prevent its degradation into a dumpsite again. I wondered if a community garden could be that activity. I came to Adhyayan with the basic idea for this project but once on site and with better understanding of all concerned elements, these 8 weeks have seen a lot of trials, errors and rerouting of strategies. The times when I’m not at Adhyayan I’ve been contacting my ex-professors of architecture, colleagues and friends, discussing the project with them and getting valuable feedback and suggestions. Ravi Gulati is the founder of Manzil, an organization working to empower youth from under-privileged communities to supplement their education beyond academia. 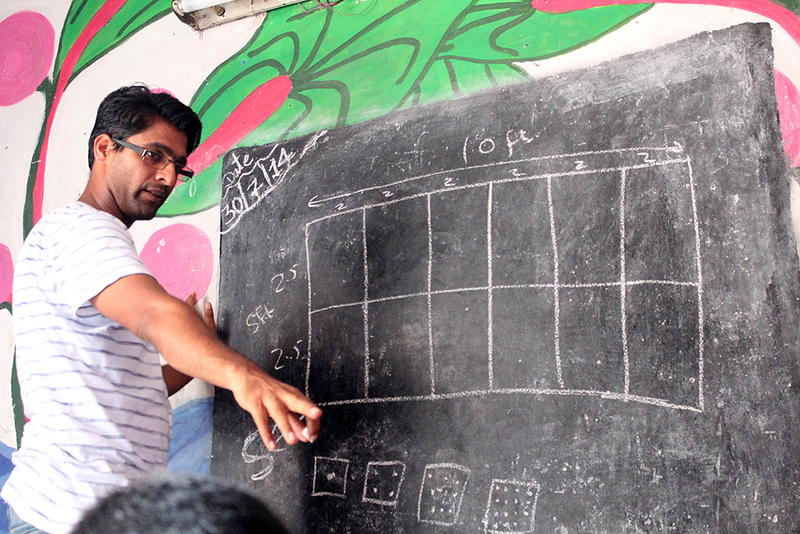 Amit, the founder of Adhyayan was in fact a student at Manzil himself many years ago and started Adhyayan wishing to pass on the lessons he learned to the children in his village. Ravi has been a wonderful mentor and guide throughout the inception and duration of this project helping me evaluate and overcome many of the hurdles I faced. On my mention of my interest of introducing urban farming in the community as another strategy of making them take ownership of their spaces and become an example to the outside city, offering an active and valuable demonstrational attractor, he introduced me to Kapil Mandawewala, founder and CEO of Sanjeev Fresh, an organic farming consultancy service based out of Gujarat, India. 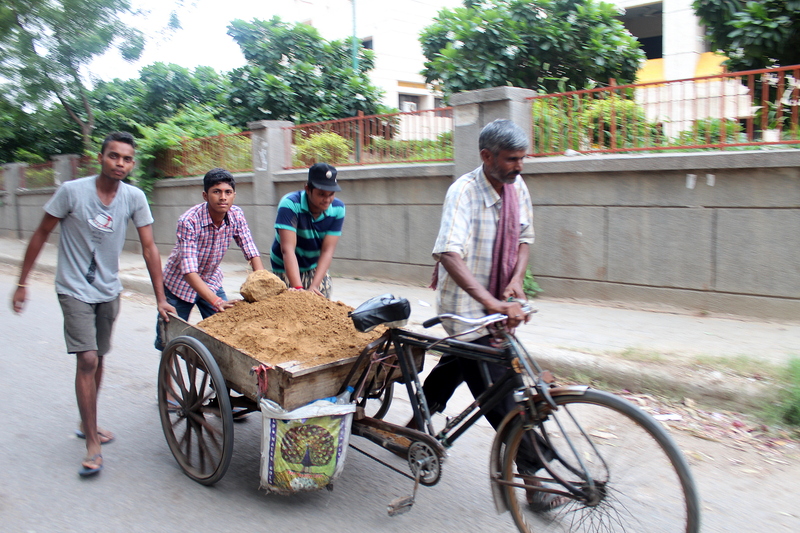 One of the key projects that Kapil is engaged in involves educational workshops in urban cities on urban farming. Kapil was kind enough to offer his services to hold a workshop with the students at Adhyayan. I wanted to have these children to initiate the practice in their community and become the tools of teaching the rest of the residents. 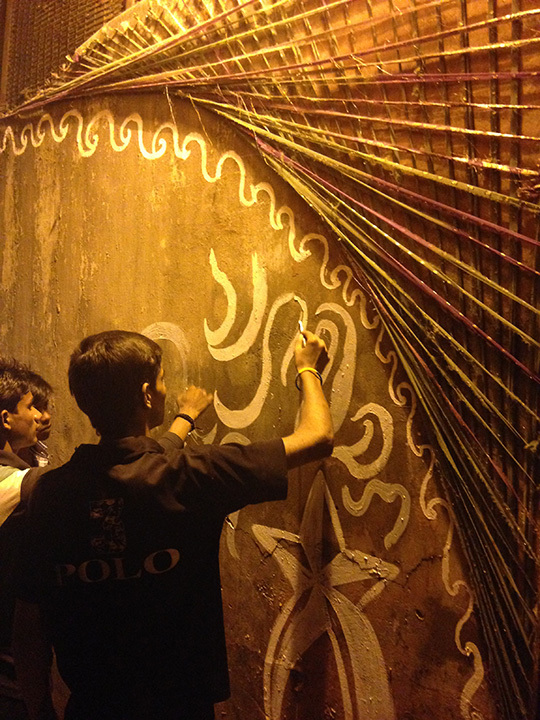 A few weeks ago, along with our explorations in way-finding markers and street art we started the process of reclaiming the ‘mandir wala park’ (park next to the temple). I had been in contact with Kapil who was guiding us on how to set up the space and the beds in preparation. 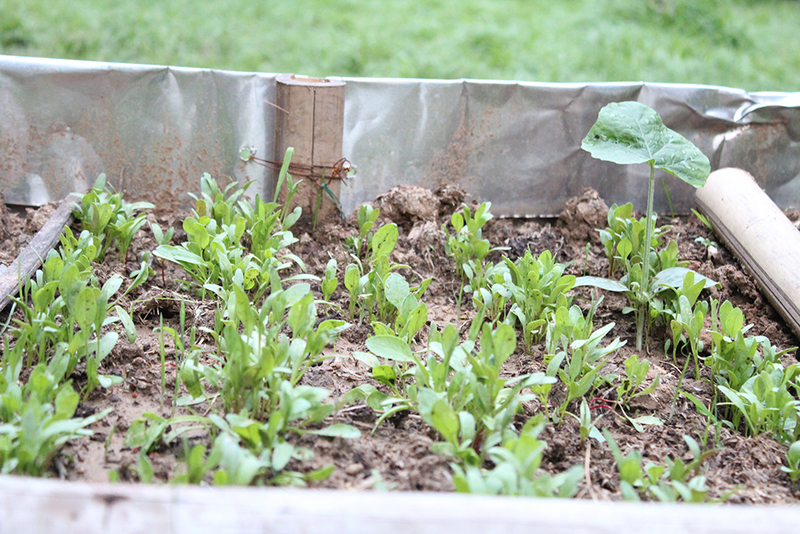 Despite being a softscape, the main concern of urban farming here is that raised beds are needed. We procured the soil from nearby construction site’s excavation pit and the manure from one of the community’s cowsheds, all for free. 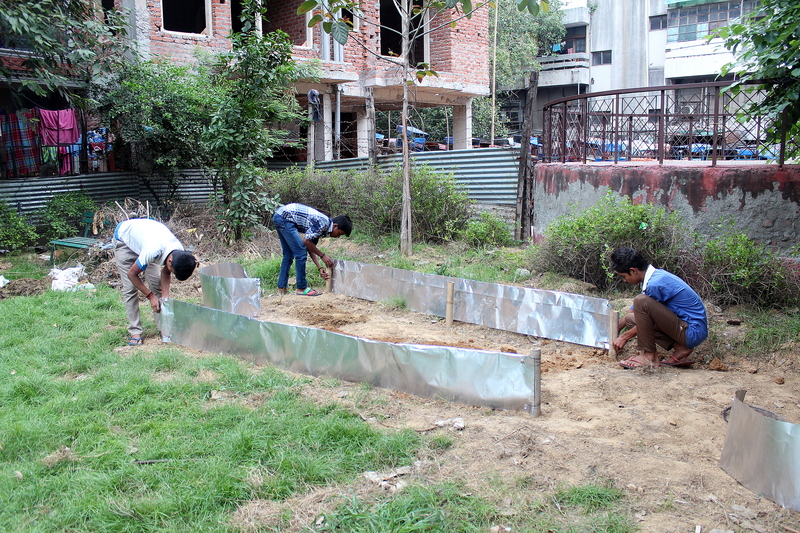 Kapil then came and held a daylong workshop with a few students about urban farming, its practice and benefits. One of the most important components of the workshop was the teaching of the compost creation. 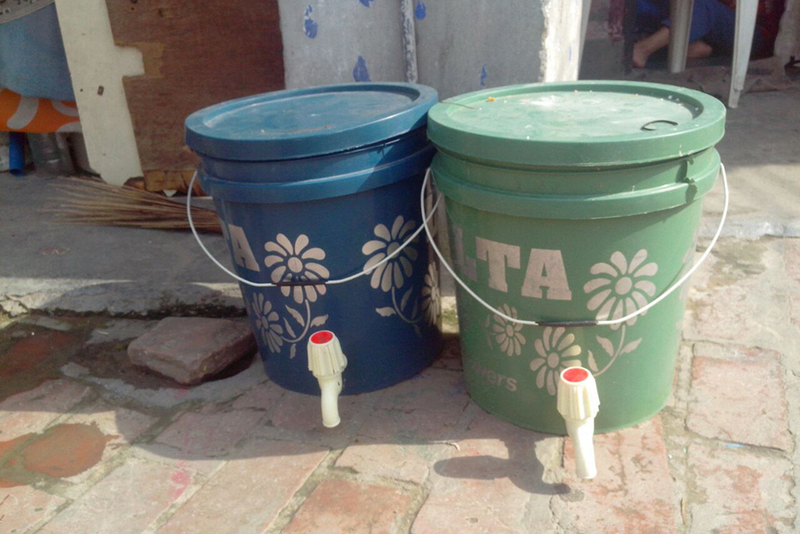 We are engaging in ‘Anaerobic composting’ of own kitchen waste – composting of household organic matter in the absence of air, in small containers. This allows for households to compost and dispose of their kitchen waste within their own homes as the container sizes are very small, and cause no unpleasant smells as it’s a closed system process, working with an absence of airborne bacteria. Since this was our first attempt, we worked on only one bed to test the outcome. We planned and planted a variety of spinach, red saag, gourd and Indian radish (mooli) in our community lot, and the children took many seeds home to plant on their rooftops. Our choice for round one was governed by choosing nutritious food sources that had the smallest growing cycle so we could see their progress within my stay and amend any errors for the subsequent planting. 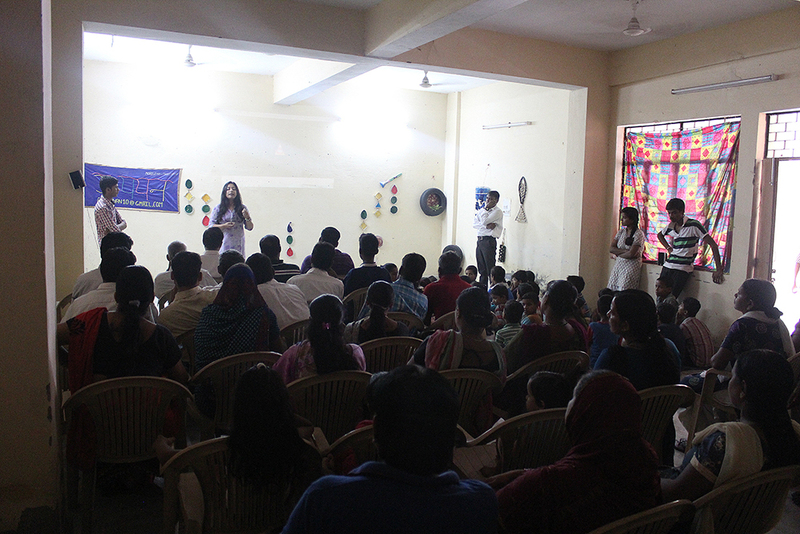 In the following Sunday’s community meeting, we held a presentation and mini workshop for the rest of the community, and handed out different seed packets. Truthfully, I was very pleasantly surprised at the degree of the positive response. There started an interesting discussion that many residents took part in. Actually it shouldn’t have been such a surprise, since almost all the family have rural connections and still have family and agricultural lands that they are connected to outside of Delhi but are separated from in the urban city. It’s been pretty amazing to see our seeds grow so well! This week we’ve started the process of setting up a few more soil beds! Wow – I can’t believe we’ve made it to the penultimate week of my fellowship. (What!) Though it feels like I just started, I’ve been wrapping up my research activities and am starting to synthesize what I’ve been learning into a final report. Since I’m interested in design research – and my project this summer has been focused on research – something I’ve been struggling with is understanding the valley between hard observations / data and meaningful insights. To me, what’s unique about doing research as a designer is that the results are actionable. You’re not seeking to build public knowledge, but to help shape future decisions on what/how something looks like, feels like, and functions in the world. But how do you get there? Because design is so hot now, writings on methods for productivity, how to spark creative thinking, versions of the design process, and the psychology of creativity exist in abundance. I’ve explored them looking for answers, but I never usually find satisfying ones. I don’t mean to discount the many tools designers (and people in related disciplines) have developed for synthesizing research. There is an arsenal of charts, matrices, and maps that visually lend structure and value to research findings. But I believe there is some element of individual trajectory and intuition that these can’t address, since the creative process is so divinely personal. Perhaps it can only be honed through practice. What I really want to understand is how creative individuals create their magic, mojo, secret sauce – what happens between absorbing the mess of everything around them and the action of turning it into something new. As a design student, it feels really silly asking the questions, “Where do good ideas happen? ?” It feels kind of like watching one of those Discovery Channel TV where a crew of explorers very earnestly goes on an expedition to find Bigfoot. I’ve been exposed to quite a few different processes while at RISD – and during this internship – but in my experience, it’s not something we actively talk about or reflect on very much on in the studio. Something that I love about RISD is that we learn how to navigate challenges rigorously through making, building, and creating. We respond to questions by making. Yet, I think deliberately reflecting on the process – rather than just doing – is a critical part of learning to craft our own practices as designers. In a course I took last spring with Cas Holman, we experimented with integrating play into the design process. 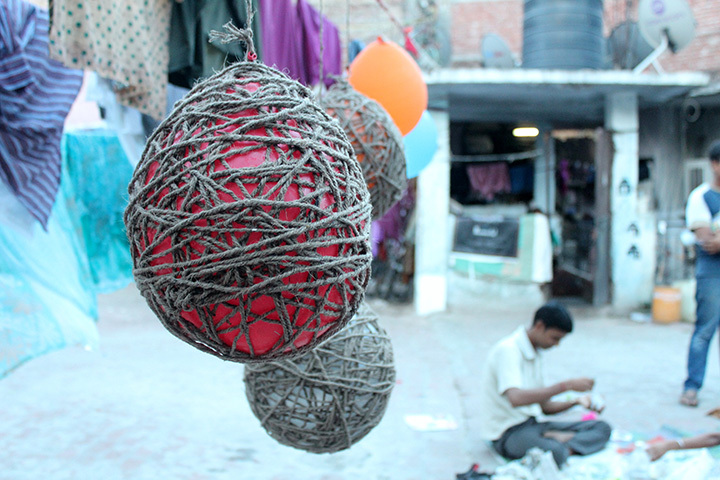 Play became a platform to ideate as we engaged in games to spark ideas and conversation. Moving and doing translated into thinking and making. This is a design studio!? In a project I worked on with the awesome Allison Chen (making us Allison^2) – we did some making to think to get unstuck. Our project focused on the relationship between gender and wearable technology, and our process took us on a detour exploring gendered toys. It took hacking at some toys with a saw and screwdrivers in order to get back to our real project: wearable technology. The toys didn’t really have anything to do with the result of our project, but we wouldn’t have gotten there without some physical creations and a few detours. Unfortunately, I couldn’t find our actual pictures, but you get the idea. Sometimes (or often) the process can be painful. I’ve been in many 3hr+ long meetings with partners and project teams where we seemingly smash ideas together until something happens. The process is also often obsessive. In a research project I did with Liz Connolley on aging and cooking, we spent many hours documenting, post-it-ing, mind-mapping, writing, asking questions, revisiting, testing new angles, until we reached clarity on our key insights. I realize that in the examples above, I’m lumping together things that seem more like synthesis of research findings and concept generation. Perhaps it would be more clear if I separated parts of the process in my mind. Yet, I’ve learned that there really is no clear distinction between research and making, creating and reflecting: the creative process is supposed to be messy. My mentors have been encouraging me to be consistently writing and reflecting in order to process what I’ve been seeing, experiencing, and learning. Reflection has been a big part of this process this summer–both in my housing research and in the broader context of my fellowship–and it’s been great to be given space to think about design on a more meta level. Although I’m describing this synthesis process as an often painful one, this is what I love about being a design student. It’s facing that blank sheet of butcher paper head on, learning to be embrace not knowing, and organizing ideas into something elegant. Something I’m growing into as a designer (and a person) is being comfortable with being uncomfortable. It takes a lot of messiness to get somewhere.